CLAYTON — Sidney ran its record to 10-1 overall by narrowly escaping Northmont with a 72-68 victory Tuesday night. Sitting atop the American North division in Greater Western Ohio Conference with a 9-1 mark entering Tuesday’s game, the Yellow Jackets opened the game with a 10-0 run that coach John Willoughby thinks might have made his team overconfident against the Thunderbolts, who are in last place in the National West. Northmont countered by going on a 16-2 run to lead 16-12 after the first quarter and went on to hold a 24-23 advantage at halftime. Darren Taborn scored seven in the third quarter including a trey, Andre Gordon had 10 and Trey Werntz hit a 3-pointer to help the Yellow Jackets take a 45-41 lead entering the final period. Northmont limited Gordon, the conference’s 4th leading scorer averaging 23.5 points per game, to only two points the entire first half. He scored 20 in the second half by going 6-for-6 from the free throw line in both of the final two quarters. Prophet Johnson led the Thunderbolts with 16 points and Justin Golson had 13. The Thunderbolts took a 53-51 lead when Danny Lewis came up with a steal and Patrick Ivory scored a dunk. 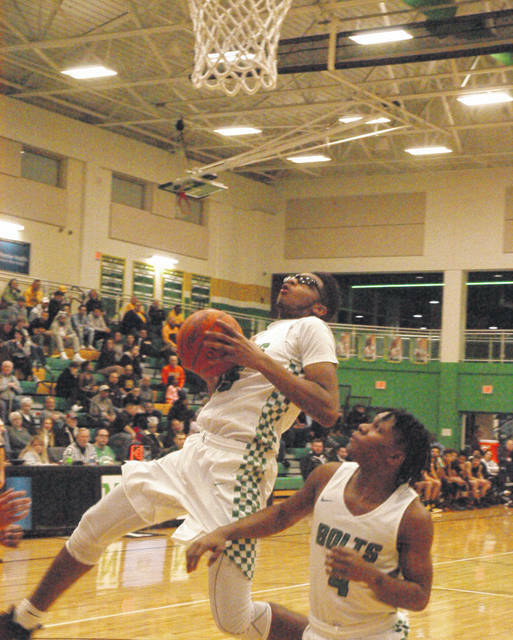 Taborn fouled Jordan Smith who sank one of two free throws and Prophet Johnson scored to boost Northmont’s lead to 56-52. 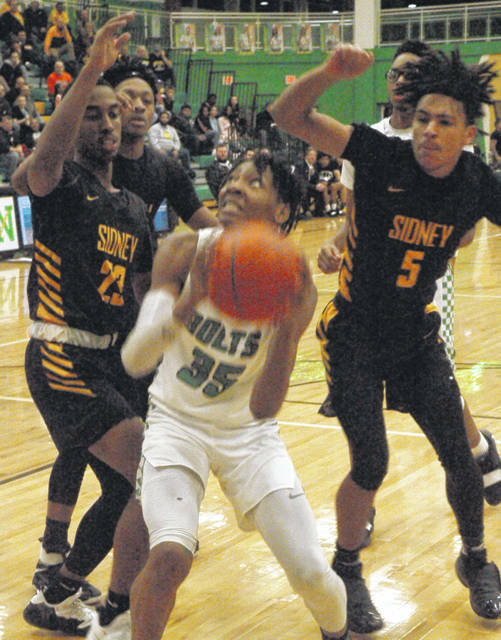 Sidney tied the game at 59 on a basket by Keith Lee but Isaiah Baldwin buried a 3-pointer from the left corner to put the Bolts back on top 62-59. Gordon drew a foul and converted both shots and after a Northmont turnover Josiah Hudgins drew a foul and buried both free throws to put the Yellow Jackets on top 63-62. Danny Lewis drew a foul from Jace Conrad and converted both shots to put the Bolts up by one. Both teams traded baskets and Gordon drew a foul from Baldwin and sank both free throws to put Sidney up 67-66 with 1:27 left. At that point both teams had 10 fouls each in the second half. When play resumed Patrick Ivory drove the lane and got called for a player control foul. On the change of possession Lathan Jones scored, drew a foul and sank the bonus shot to put Sidney up 70-66. Willoughby felt that foul was key to his team’s success. Jordan Smith scored on a baseline drive to cut the Sidney lead to a basket with 28 seconds left. 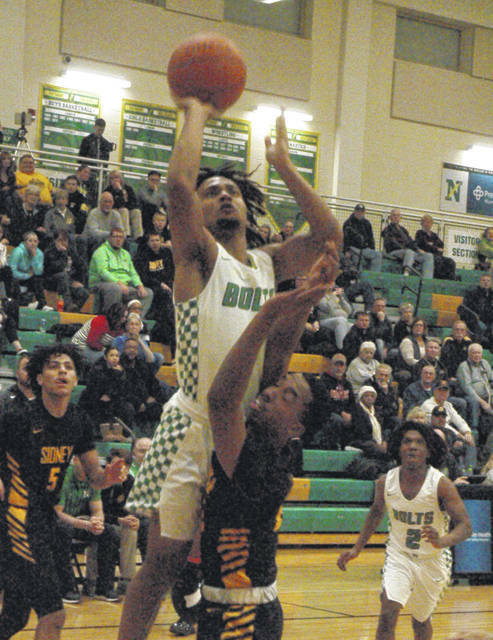 After a Northmont timeout Sidney worked the ball around before Gordon drove inside past the glass and made an underhand shot over his head that went in to make the final tally 72-68 in favor of the Yellow Jackets. Based on both teams records Willoughby was asked if the game was tougher than expected. The Thunderbolts out-rebounded Sidney 39-21. Northmont Coach Shane Kincer was extremely happy with how tough his team played against one of the GWOC’s top teams. 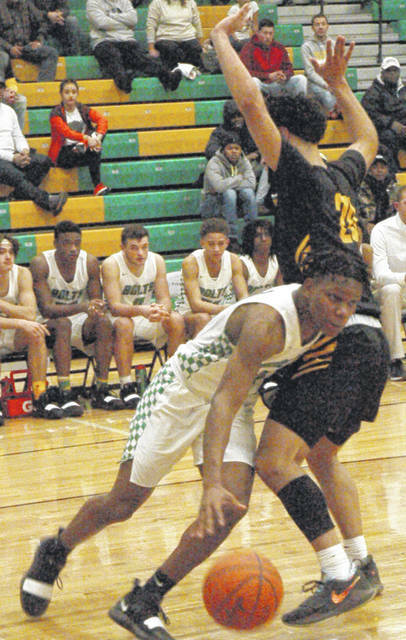 Northmont has the rest of the week off and won’t play again until Tuesday at Chaminade-Julienne, at Centerville on Friday, Jan. 25 and at Trotwood-Madison on Saturday, Jan. 26. Sidney: Ratez Roberts 5-2-12, Jace Conrad 1-0-3, Darren Taborn 3-2-10, Keith Lee 3-0-6, Lathan Jones 2-1-5, Andre Gordon 5-12-22, Josiah Hudgins 2-4-8, Trey Werntz 2-0-6. Totals: 23-21-72. Northmont: Miles Johnson 1-0-3, Danny Lewis 2-2-7, Di’talian Rayford 1-0-2, Patrick Ivory 3-3-9, Justin Golson 5-3-13, Isaiah Baldwin 1-0-3, Jordan Smith 3-3-9, Ifeanyi Nwanoro 2-0-4, Corey Gay 1-0-2, Prophet Johnson 4-8-16. Totals: 23-19-68. 3-point goals: Sidney 5 (Taborn 2, Werntz 2, Conrad); Northmont (M. Johnson, Lewis, Baldwin). Records: Sidney 10-1, Northmont 4-8. JV Score: Sidney 52 Northmont 41. Prophet Johnson tries to set up for a shot in the paint and draws a foul from Sidney’s Darren Taborn (5). Johnson sank both free throws and finished the game as the Thunderbolts leading scorer with 16. Jordan Smith drives inside as Justin Golson looks on. Danny Lewis puts up a shot over Josiah Hudgins. 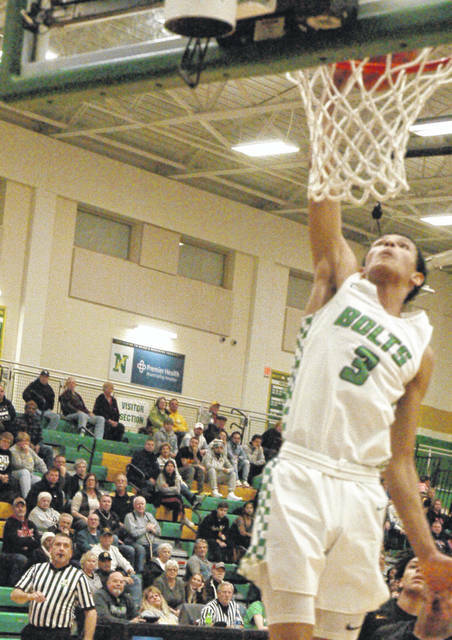 Patrick Ivory scores a dunk during the fourth quarter against Sidney. Justin Golson drives past Sidney defender Andre Gordon.